While Jane Eyre does not have the distinction of a Kate Bush song dedicated to it, Charlotte Brontë’s story is perennial, with at least 24 adaptations having been produced to date. The 2011 effort, shot on the wild and windy moors of northern England, is a welcome addition to a crowded canon. Gloomy but not relentlessly so is this tale of an intelligent young woman of indomitable spirit. Jane Eyre (Mia Wasikowska) wanders across the moors and turns up near hypothermic at the door of the Rivers family. They install her in a teaching position and she recalls a childhood characterised by neglect and abuse, followed by her time as a governess at the country estate of Mr. Rochester (Michael Fassbender), with whom she fell in love on equal terms. Cary Fukunaga shot Jane Eyre entirely using available light, and this leads to a natural feel that ranges from warm to bleak to high dudgeon. Plain though he has tried to make Wasikowska, Fassbender and Judi Dench, they all have an air of humanity about them that is at once both comfortable in and at odds with the country environment; North England is a fickle beast and not one inclined to make life easy for these people. Much can be said of the scenery, but this movie is ultimately held up by the two people at its core: Jane and Rochester. Good though Dench may be as Mrs. Fairfax, she is mere window dressing for these two people, who have been promoted to the exclusion, but not detriment, of all others. 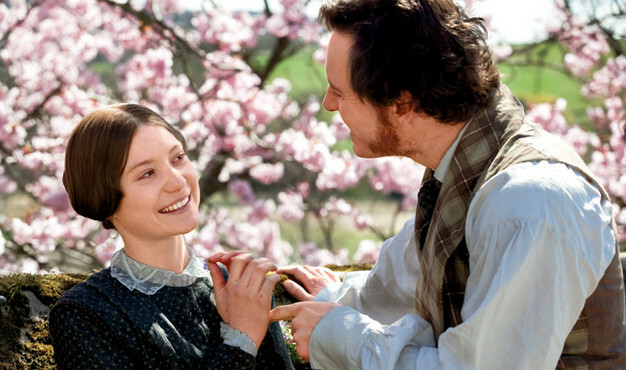 This is the very nature of Rochester: he has the time and patience for only one person, and the world shrinks when Fassbender shares the screen with Wasikowska. The intensity of their relationship, their verbal interplay and shifting physicality, is so tangibly translated to the audience that I felt invested almost from their first exchange. Rochester has likely been interpreted as an abusive man across the years, and he has a dark secret plaguing him, but Fassbender’s version is a tortured soul who is quick to tire of people but desperately wants to be good. I got the impression that Wasikowska’s independent and intelligent Jane was not simply drawn by an inexorable force to the latest in a long line of abusers, but rather that she could recognise a good thing when she found it, especially in such socially trying times for a woman. It is true that Jane Eyre reaches its conclusion through a series of contrivances telegraphed far in advance, but this is symptomatic of its mid-nineteenth century origins, when these things were de rigueur. I can’t hold this against it, because I feel that the conclusion was exquisite; the film’s final moment is the most perfect that I’ve seen since the very different Hanna earlier this year. Jane Eyre may be too dreary for some to penetrate, but Jane and Rochester have the benefit of not being fundamentally stupid like Wuthering Heights’ Cathy and Heathcliff and there is a genuine warmth about them that conquers the atmosphere. I cannot tell you if Fukunaga has directed a good adaptation, as I am unfamiliar with the source material (a blasphemous admission, no doubt), but he has made a very fine film indeed.